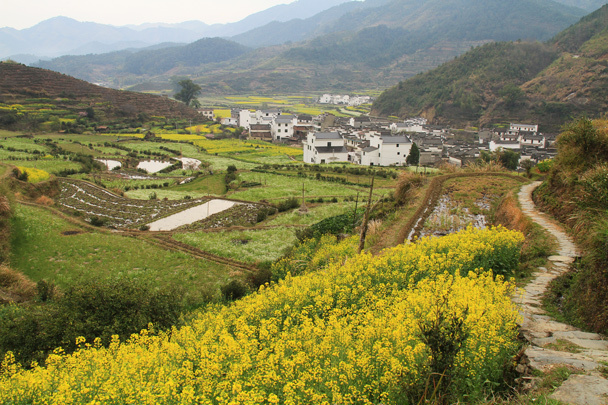 In Brief: The sights and scenes of the hills and valleys of Wuyuan, Jiangxi Province - fields of flowers, small riverside villages, and more. 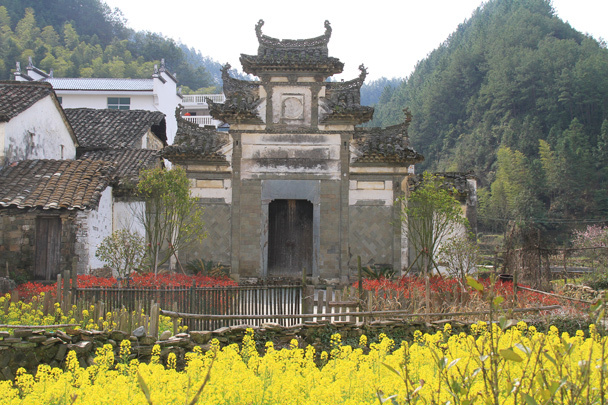 Our spring time trip took us to Wuyuan County in Jiangxi Province. 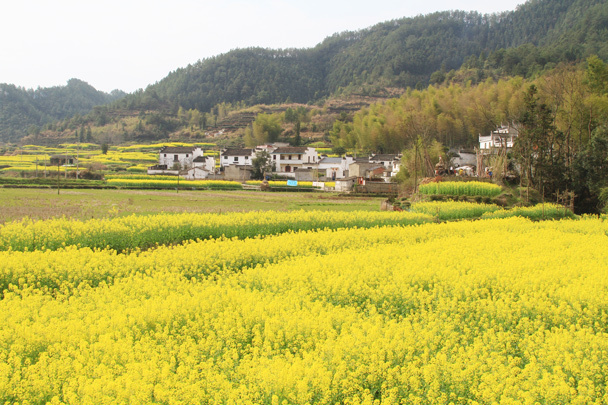 We'd timed it just right to find the fields full of canola flowers, making our visit to the villages and valleys of the area even more beautiful than usual! 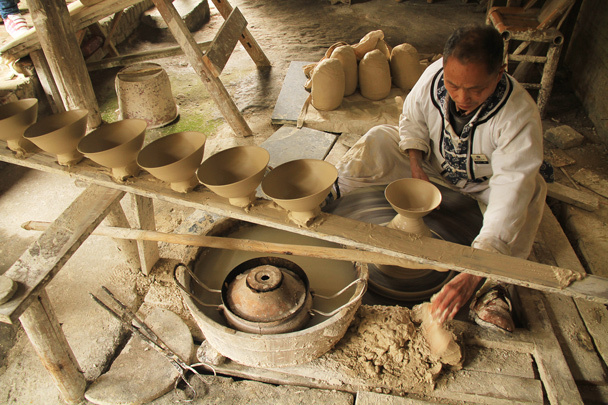 We flew into Jingdezhen, a city known as the 'Porcelain Capital of China'. 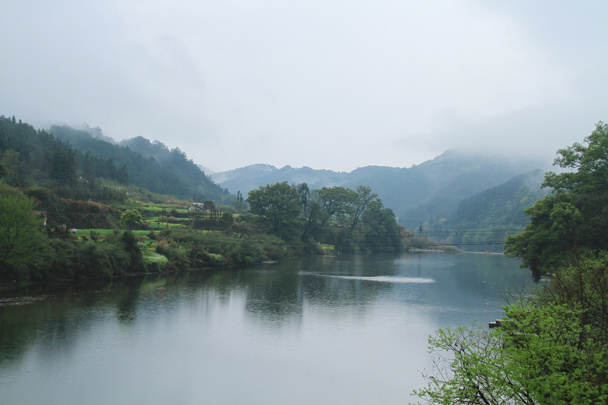 More on that later, because our plan was to get into the countryside as quickly as possible. 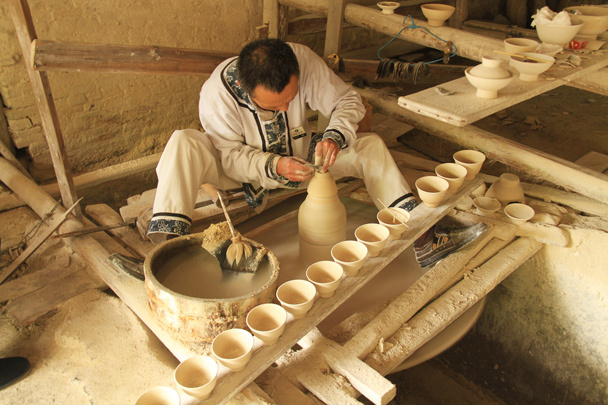 The second and third days of the trip were spent exploring the sights of rural Wuyuan - hills and rivers, fields of flowers and crops, and ancient villages. 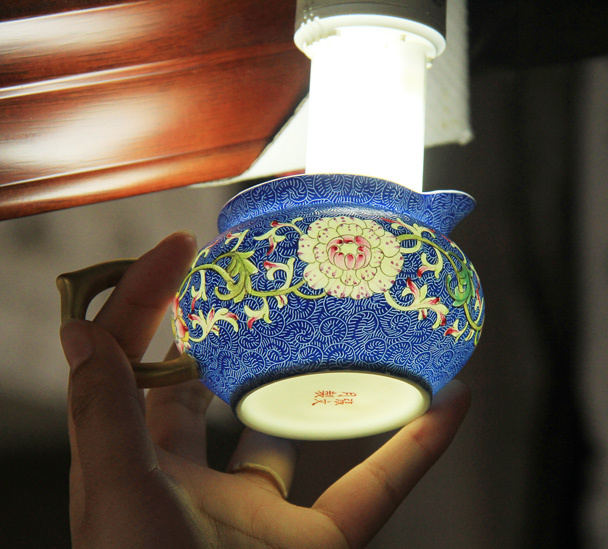 On the last day we headed back to Jingdezhen, and took the opportunity to visit a porcelain workshop, where we saw artisans crafting beautiful vases and plates using the traditional methods. Scroll on to see Huijie's photos! 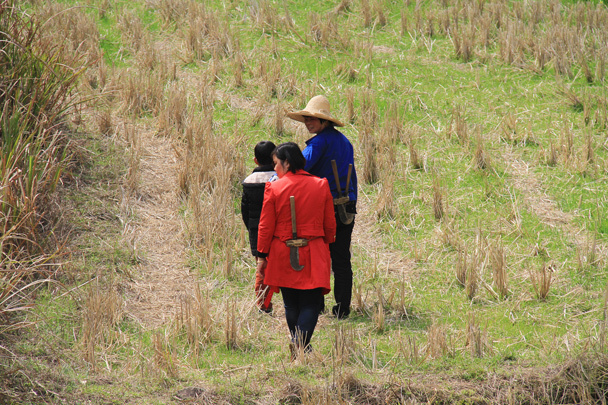 In Wuyuan, the villagers are headed out to do field work. 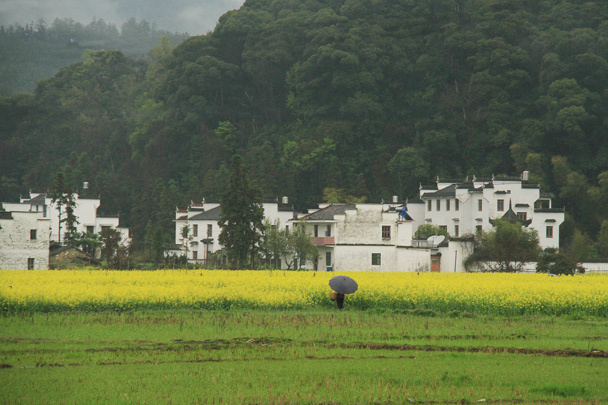 A small village, surrounded by fields of canola flowers. 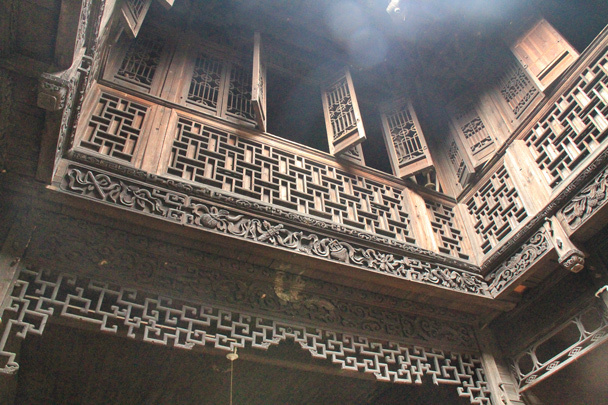 Beautifully carved eaves adorn one of the homes in the village. 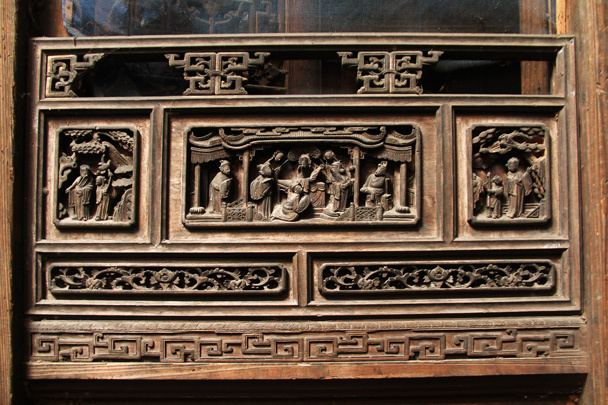 More of the specially carved woodwork, this one as part of a door frame. 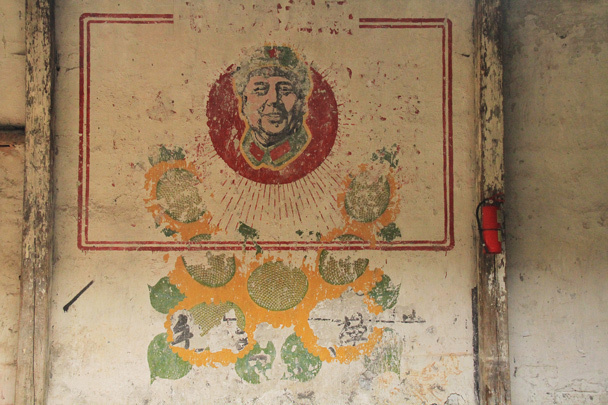 A sign of the more recent history in the area. 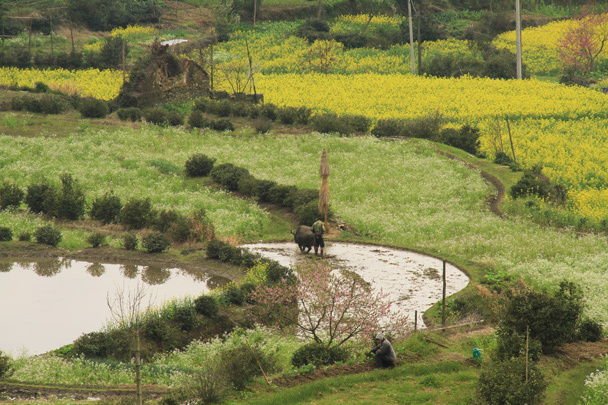 A water buffalo in a rice paddy. Water buffalo are one of the main beasts of burden in the area. 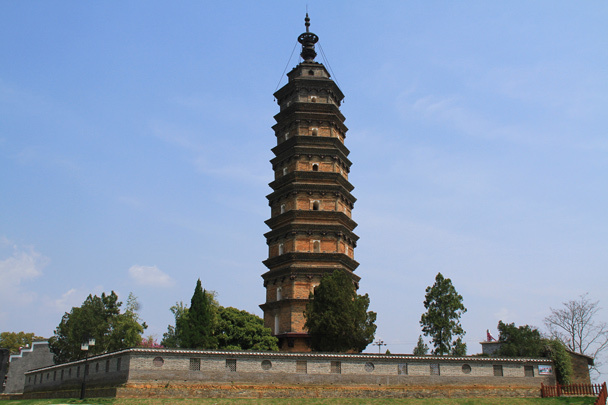 A pagoda that belongs to a Buddhist temple. 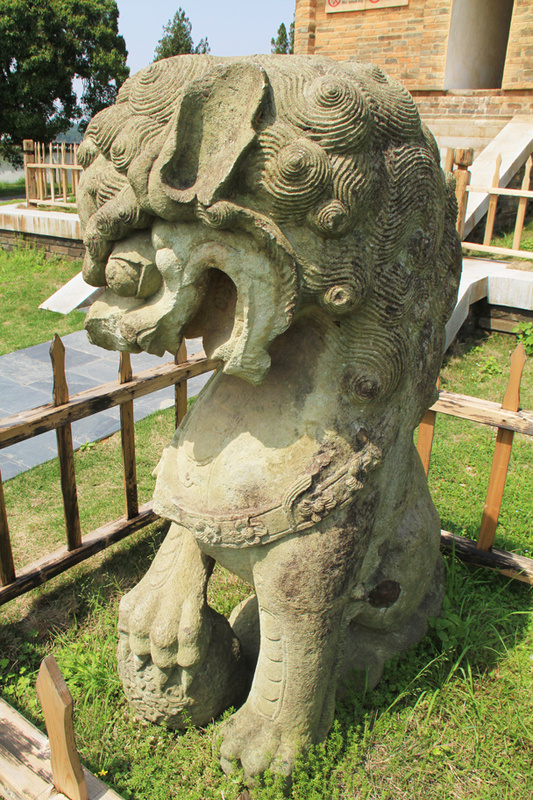 A stone lion outside the pagoda. 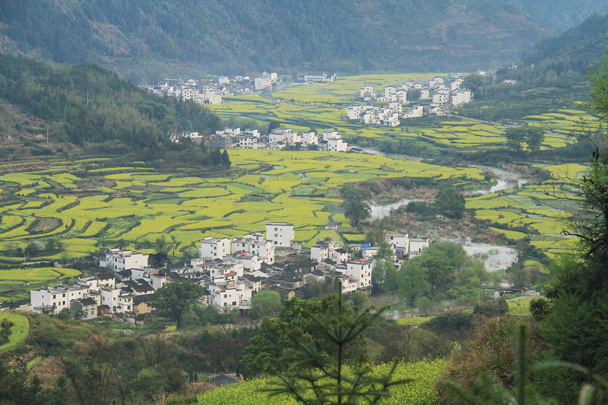 We hiked up into the hills behind the village for even better views of the fields. 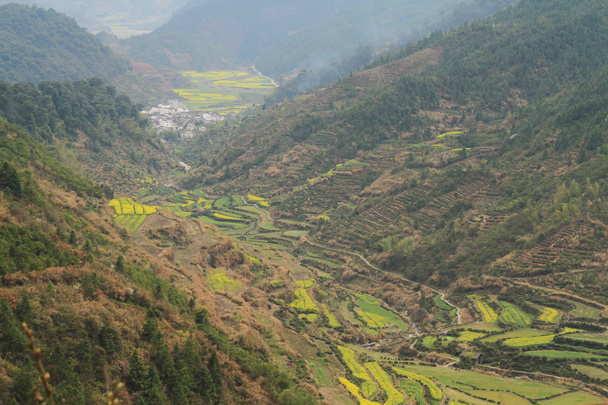 Looking down the terraced valley. 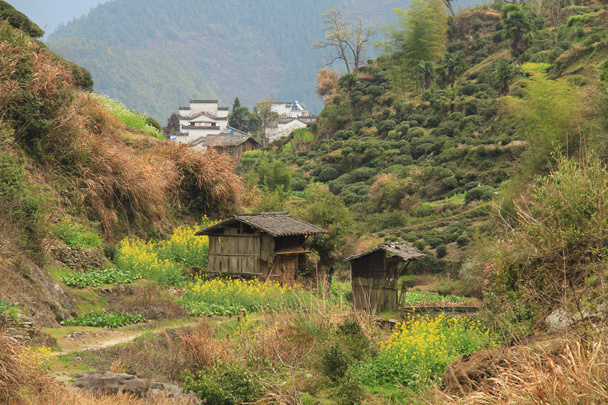 Huts beside the fields. 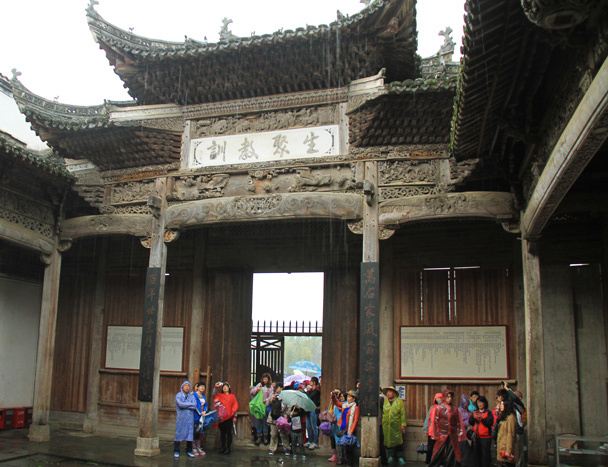 It rains a lot in Wuyuan, so it's important to be able to shelter from the storm. 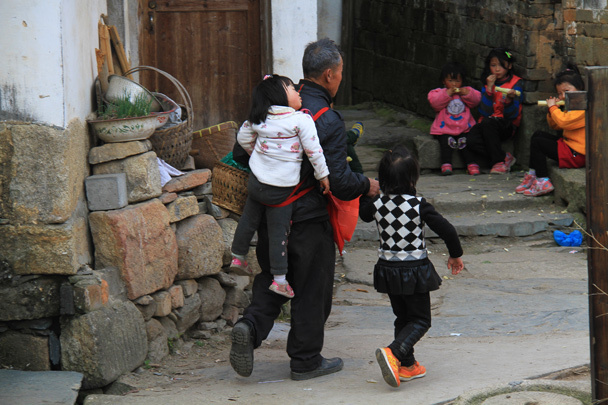 Taking the kids (or maybe grandchildren?) 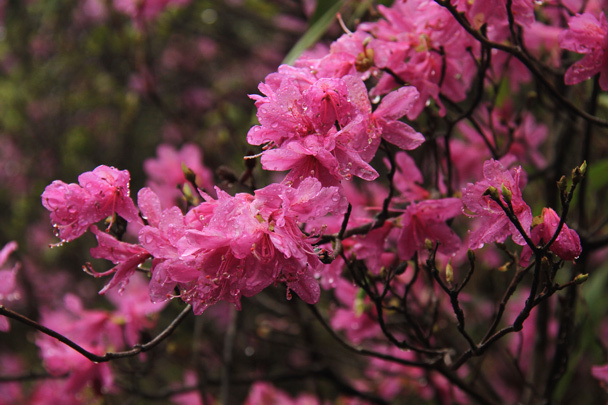 for a walk. 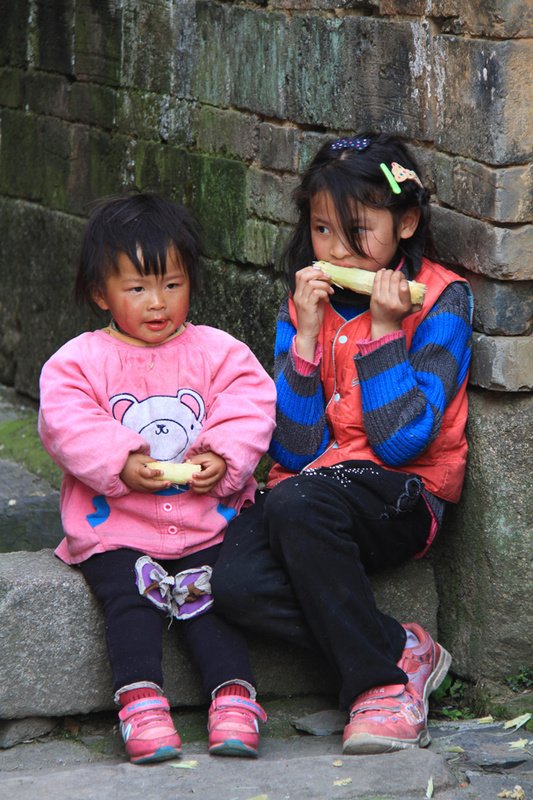 Sisters snacking on some sugar cane. 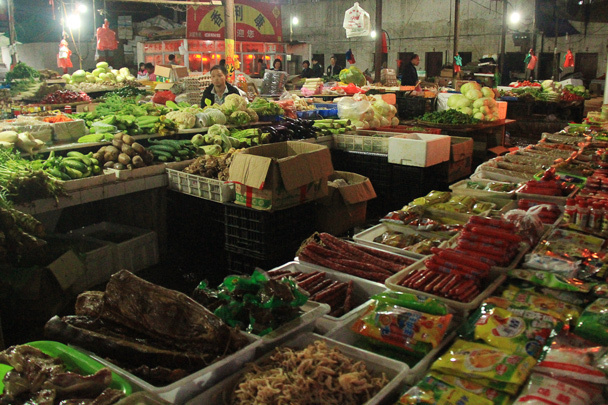 Can you spot the water buffalo in this scene? A big archway. 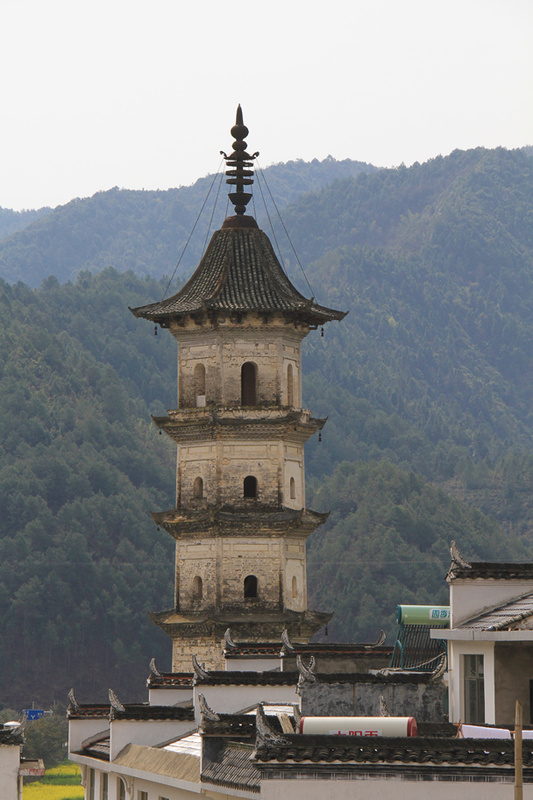 This is the local architectural style, quite different than what we see in Beijing. 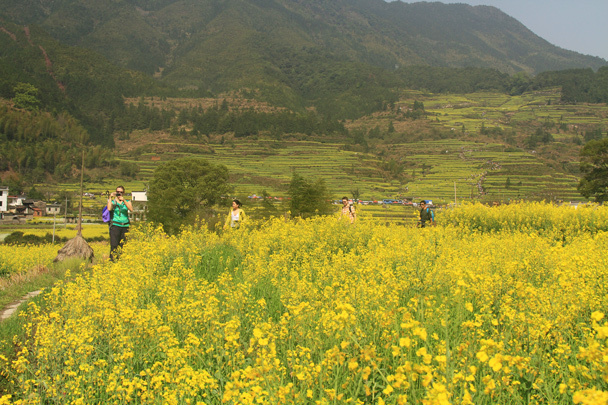 Field trails lead through the terraces. 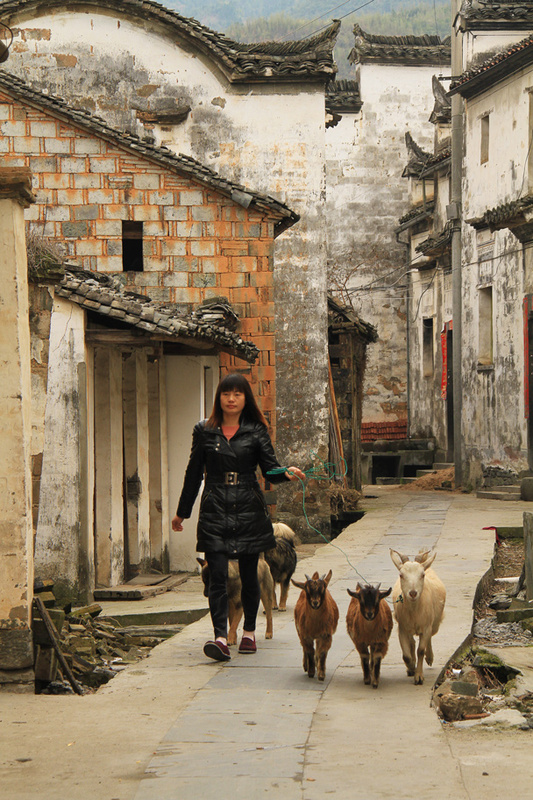 Locals follow them to work, we follow them for a scenic walk. 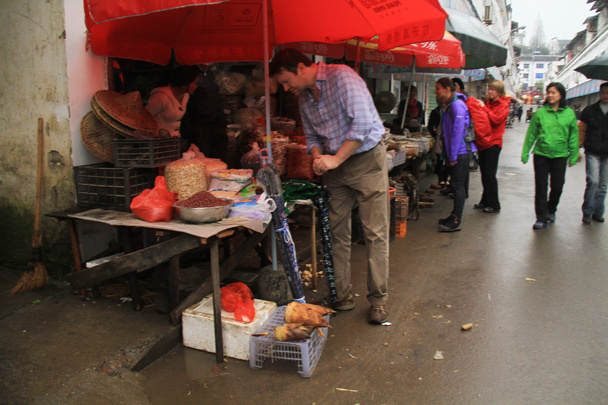 We made a visit to a local market to see what's commonly consumed. 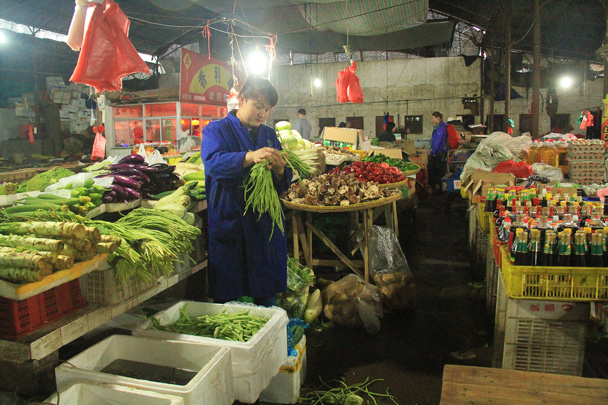 Seeing what's on offer at a local street market. 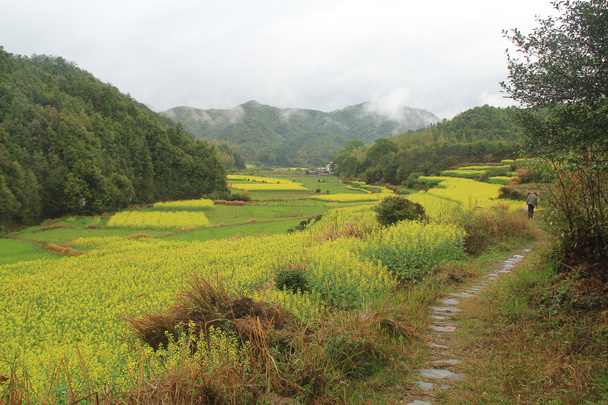 A cobblestone path leads through the fields. 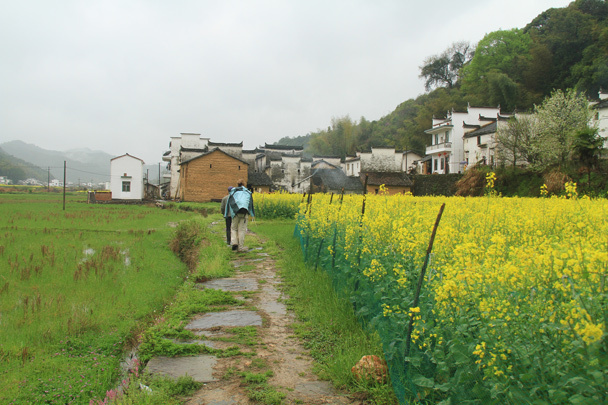 We followed the path along to the next village in the valley. 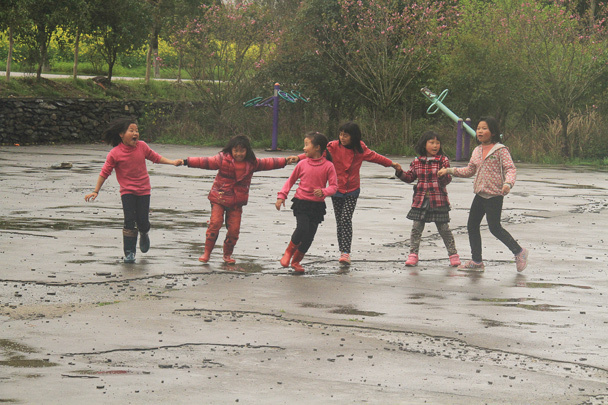 Kids playing in the rain. 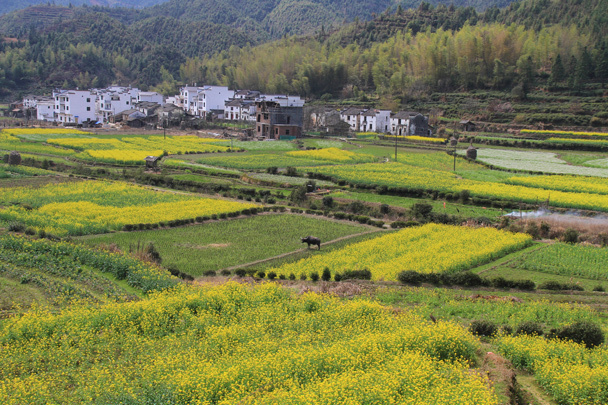 More great views of villages surrounded by fields of flowers. 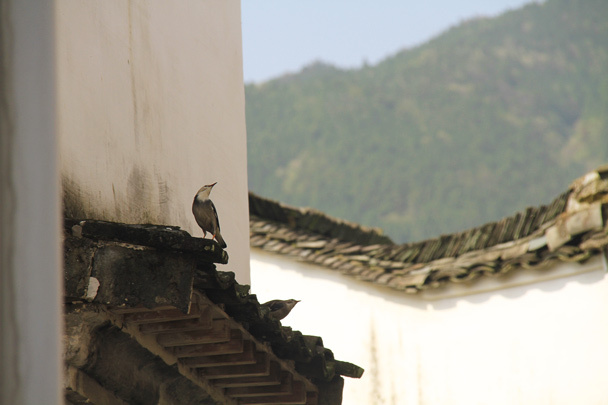 Huijie spotted some small birds singing. 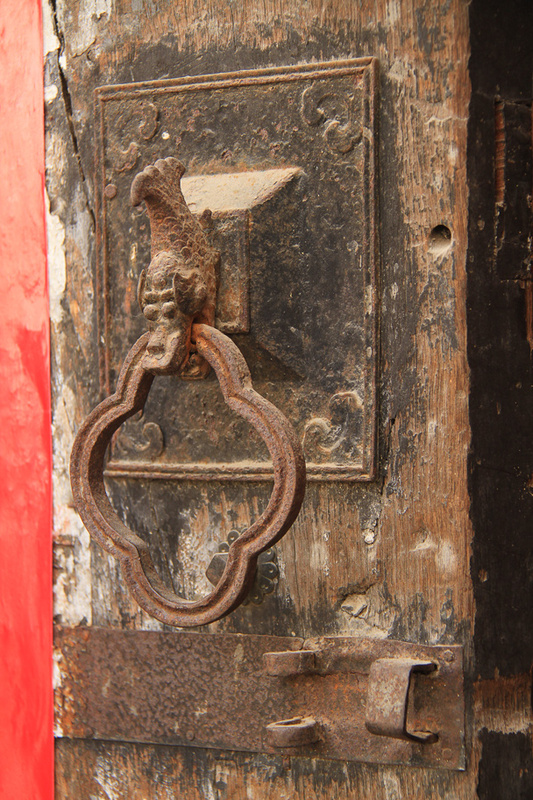 A seriously old door knocker, with a dragon's head decoration. A special scene by the river. 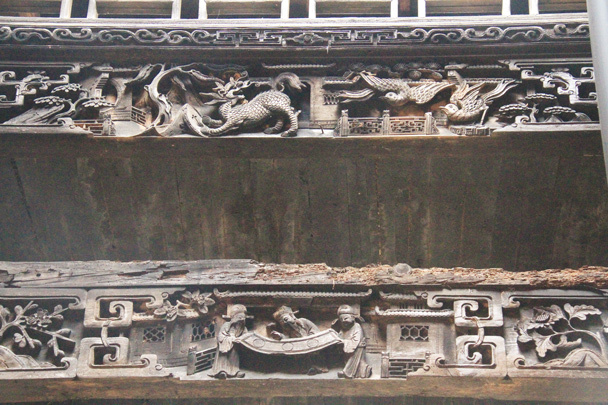 A huge archway, with the rain pouring down. 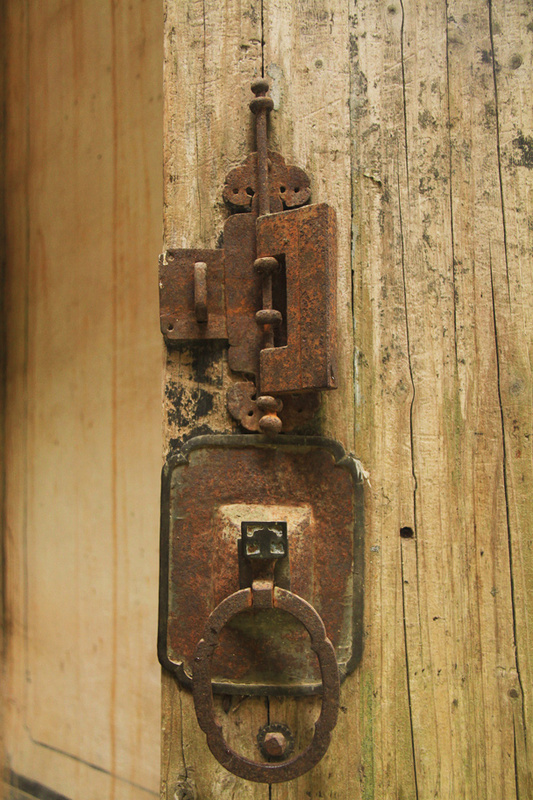 Another of the old door knockers, along with a padlock. 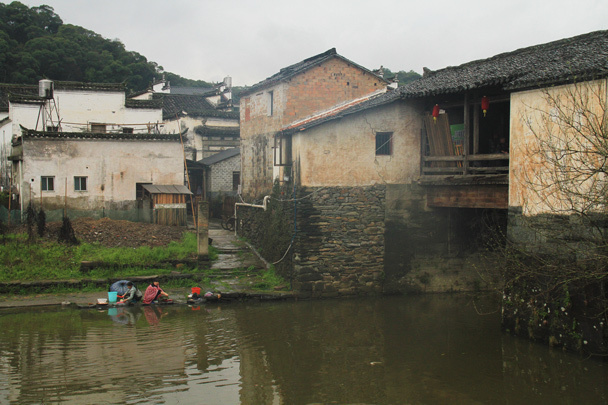 A covered bridge spans the stream, as local ladies do their washing. 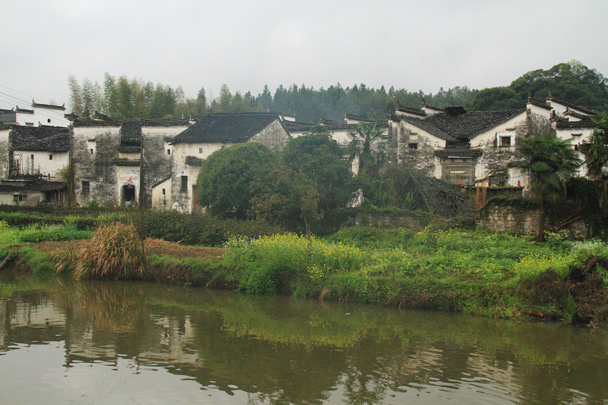 Fields, whitewashed houses, and forested hills. 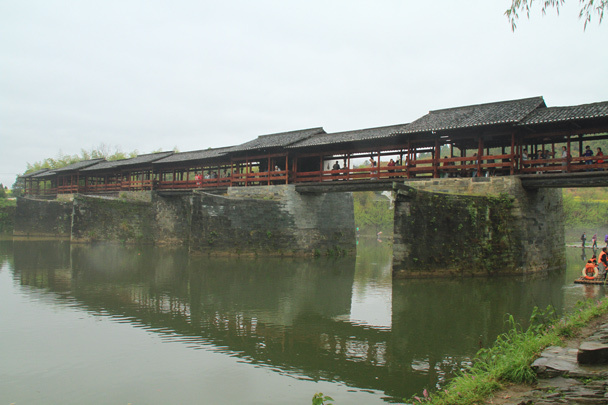 The Rainbow Bridge, here since the Song Dynasty (960-1279 AD). 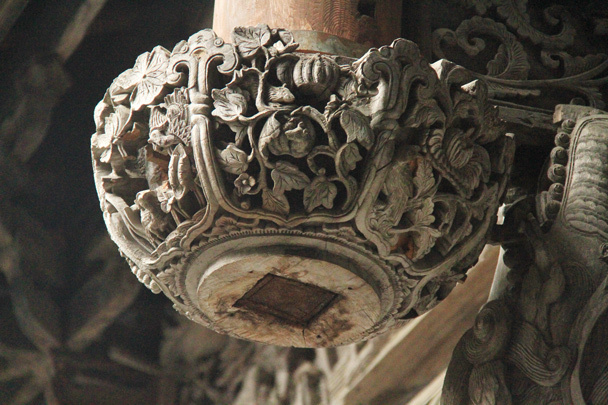 Back in Jingdezhen, we spotted a set of ceramic busts. 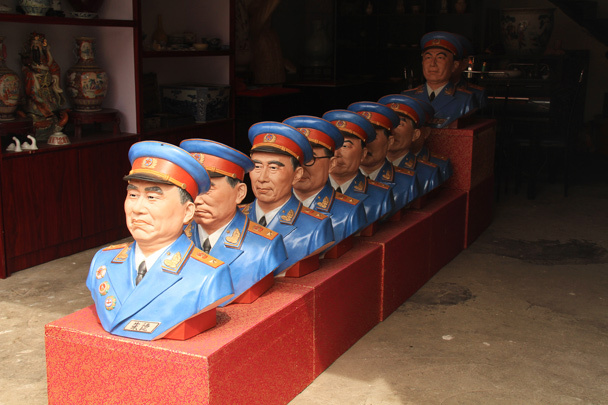 These ten fine fellows are the Grand Marshals who founded the People's Republic of China. 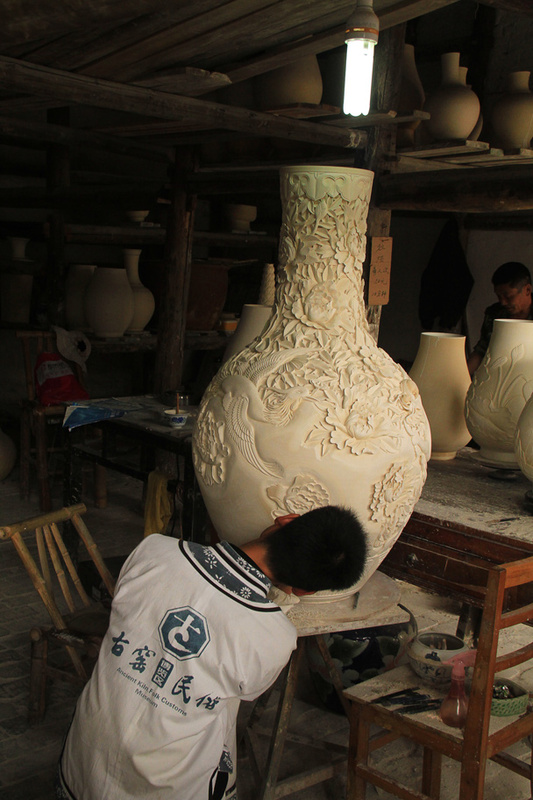 We visited a pottery factory to get a look at how they make the ceramic goods in the 'Porcelain Capital of China'. 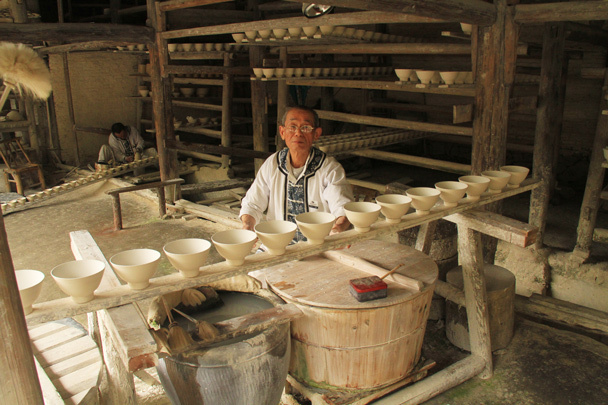 Here, bowls are being shaped by hand. Glazed and ready for the kiln. 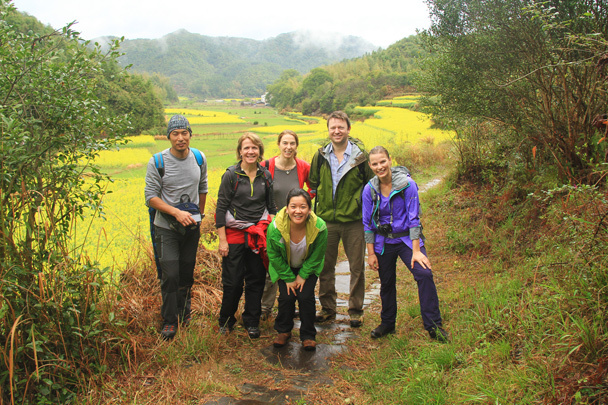 The hiking team pose for a photo with our local guide in Wuyuan. 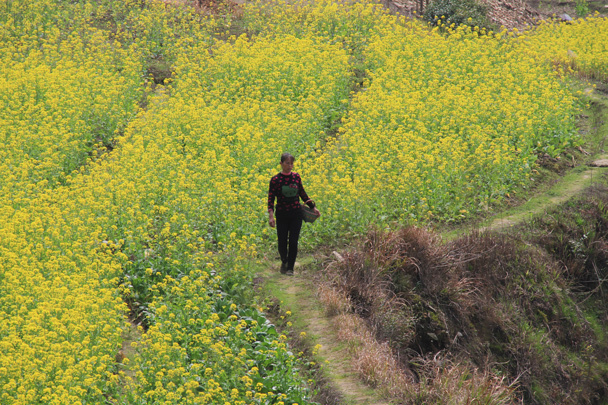 In Brief: 24 photos from a beautiful day on the trail between Gubeikou and Jinshanling.